When my daughter Lily was born, she received a lovely gift from a family friend – a handmade bedroom door sign with her name. This friend isn’t overly crafty herself, so it was a handmade gift she had gotten made for Lily. At the time I remember thinking how great it looked, but also how easy it would be to create something similar. It consisted of four mini square canvases, scrapbooking paper, ribbon and other simple embellishments. The kind of stuff I have an abundance of in my craft room. With a second daughter now welcomed into our family, with her very own room (actually it happens to be the room with Lily on the door), it had me planning ahead so she would have her very own door sign. 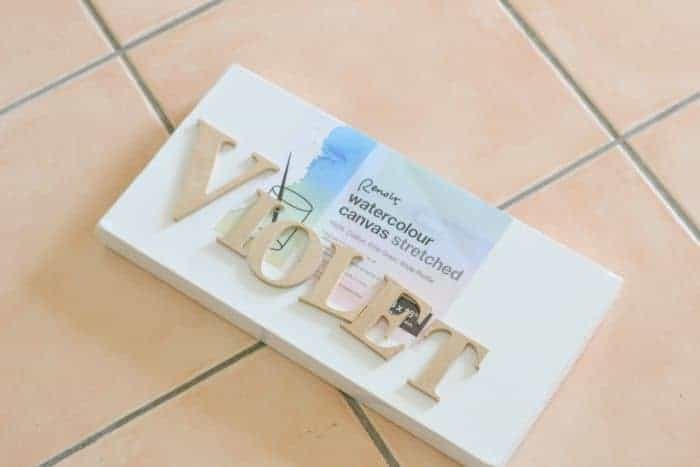 Only thing is, Violet is a much longer name than Lily, so that many mini canvases would not fit across a door. Simple solution – a single larger canvas. Today I am sharing the very simple process so you can make your very own door or wall sign as well, in any colours and materials you please. 1. Cut a piece of material large enough to cover your canvas, or canvases if you are making a separate canvas per letter. Glue fabric in place. 2. Decorate each of the letters differently using scrapbook paper, paint, ribbon and other embellishments. 3. Glue letters in place. Leave overnight to dry before hanging. I purchased the majority of my materials from Spotlight, which is a major craft retailer here in Australia. The wooden letters were their medium sized letters, and about $1.30 each. The canvas was a little more than $10, however you can purchase a variety of sizes really cheap at discount variety stores. I just happen to be in Spotlight at the time and decided to grab everything at once. The other stuff came from my existing craft supplies, which have been gathering a bit of dust lately! Use the letters as stencils when cutting out your scrapbook paper to fit. My preferred glue is Modge Podge Dimensional Magic. It’s a really strong adhesive and has a tiny tip easy for adding glue to small detailed areas. You can use scrapbook paper as your canvas background instead of fabric if you prefer. 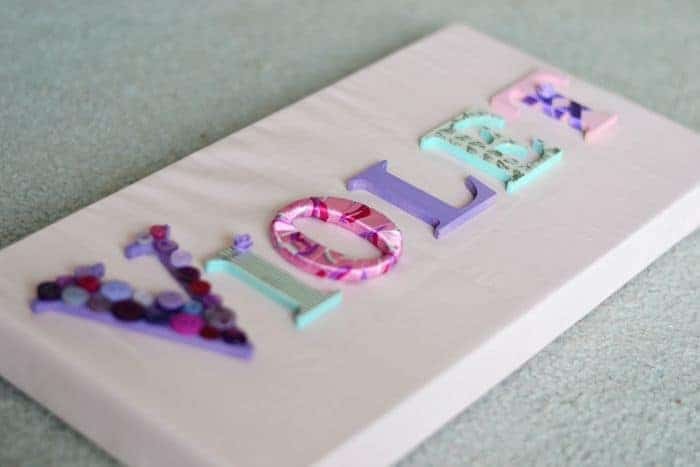 If you are covering the front of your letters with scrapbook paper, you only need to paint the exposed edges of the letters. 3 Steps – very simple! 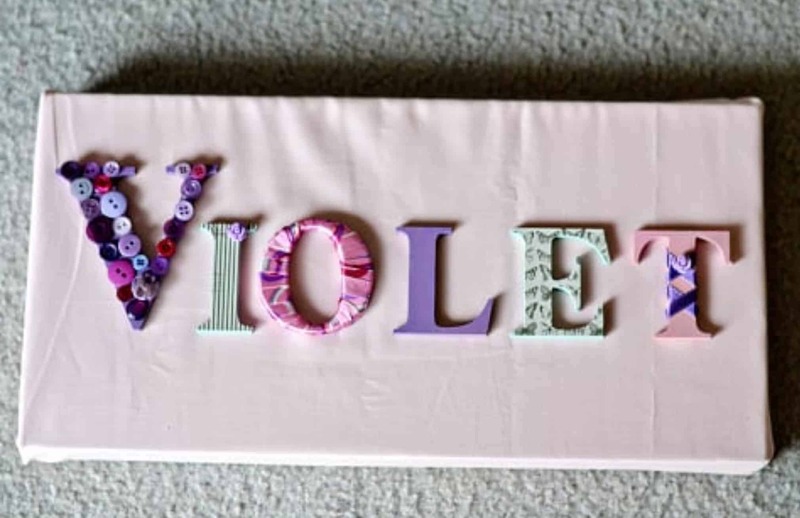 You can make one of these DIY name signs for baby shower or birthday gifts, or for your own kids’ rooms. This is a super quick project you can complete in one sitting, with that lovely handmade touch. What is the best handmade gift you ever received?